I come from a town that embraces the past (a necessity on some level in a region dependent on tourism). Downtown’s late nineteenth and early twentieth century commercial and retail structures are touted for their interesting brickwork and nostalgic styles of yesteryear. This is not its past as I remember it, however. For a small child with a vivid imagination and nascent yearnings to see the bigger world living there forty-odd years ago, Oneonta’s downtown looked to the future. Retailers put up shiny metal facades over older brick structures in an effort to keep up with the times, while other older buildings were razed, replaced with both good and bad examples of modern architecture. This period turned out to be relatively short-lived. At some point, it was decided the healthiest future for downtown would be to turn the clock farther back. 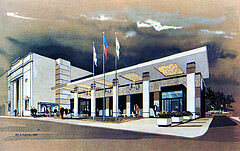 Though many love downtown’s newer, older look, I for one, miss the aluminum facades with their loopy logos. Fortunately, a surprisingly difficult search for an iBook charger during a recent weekend visit brought me down to Main Street, allowing me to rediscover other vestiges of downtown’s brief flirtation with modernism. 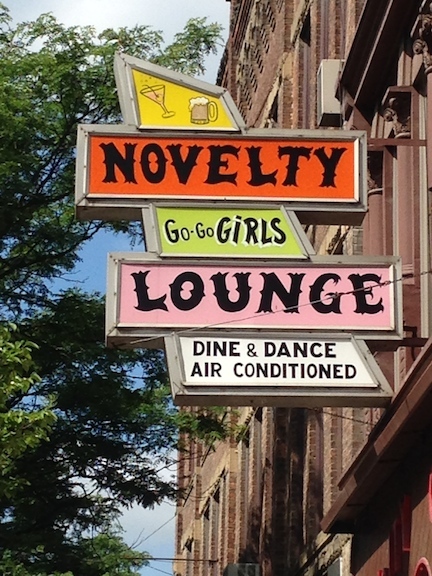 With its silhouette straight out of The Jetsons and color scheme of pink, orange, lime and yellow begging to be contemplated with the aid psychotropic enhancements, the sign for the Novelty Lounge on Main Street stopped my stroll and threw me back over forty years. The words “Dine and Dance”, Air Conditioning”, and “Go-Go Girls” spelled out in a variety of different fonts on it may seem quaint today, but at one time they dared Oneonta’s upright citizenry to jump feet first into the Swinging Sixties. When I was small, heavy drapes blocking any view through the glass doors and a window too high to peer through left only my imagination to conjure images of what happened inside this place. Go-Go girls!? Here in Oneonta? Were they wholesome and sunny, frugging away in clunky white vinyl boots, flips kept in place with wide hairbands like the ones I saw on the Monkees or Saturday morning dance shows? Or perhaps more louche types, with heavy lidded Cleopatra eyes, the fringe on their bikinis barely rippling as they swayed in cages…. or even an aquarium, plucked out of a Las Vegas lounge, New York City night club or a TV Detective show? My bet was on the latter type. Although some braver kids my age would give each other a boost up to the window to get a peek in, I never attempted such a feat, already having enough Religious Education to suspect that after playing with oneself, spying on a scantily-clad go-go dancer might just be the next surest way to grow hair on one's palms. It wasn’t worth the risk, even if it meant missing the chance to witness a scene straight out of Hullaballoo. Walking by today, unshrouded glass doors and a window I can now easily peer through reveal an interior depressingly similar to any other local tavern or bar. I like to think though, there is a storage room somewhere in the back, holding the odd boomerang banquette, space-age ashtray, perhaps even an overlooked clunky vinyl boot or oversized aquarium from its glory days. If the Novelty Lounge represented the groovier (or, seedier) side of the sixties, the Wilber Bank annex farther down the street had loftier associations. Constructed in 1967, it embraced similar principles of modernist urban design associated with large civic projects such as Lincoln Center or Edward Durrel Stone's work, scaled down for a smaller city. With its concrete-columned arcade across its façade set well back from the street’s building line, a mini-urban plaza was created. Enhanced by a square fountain begging for children’s pennies and a glass vitrine containing advertising and displays which relieved the windowless bearing wall of the adjoining building, the space was designed for far more than mere banking. Stumbling across two dozen protesters here in the early 1980s urging the bank to divest of its South-African investments likely marked my first awareness that even my small, relatively sheltered community was connected to broader global issues and trends on some level (other than maybe hearing the story of the woman at Burger King on Main Street who choked on her french fries when she saw a streaker dash by a decade earlier). Although the name of the bank has changed and the effect of the fountain has been diminished somewhat by the replacement of the angular, crisply trimmed yew with a rather unfortunate suburban planting scheme, I was excited to see how many of the original elements remained intact. Even the interestingly shaped benches and brutalist ashtrays are still there, beckoning passerby’s to sit for a moment, perhaps even to have a smoke before making a wish and tossing a coin in the fountain. Standing on the corner of Elm and Walnut Streets, St Mary’s Roman Catholic Church represents my earliest connections with modernist architecture (and religion). In a region where churches tended to be white wooden affairs in the tradition of a New England meetinghouses or infinite variations on the gothic style, St Mary’s was something else altogether. Built in the 1950s, its cubist exterior is a good example of form following function. Although there were some nods to older ecclesiasticism inside, where a traditional looking crucifix hung over and ornate tabernacle sat above the altar, overall the church felt bright and modern. Even the stained glass seemed more inspired by cubist paintings than cathedral windows. It was a perfect setting for the Post-Vatican II folk masses my family went to, with turtleneck clad, vested guitarists happily strumming away, singing homilies. Sister Mary Mead would have been right at home. The only dark cloud hovering over the relatively sunny memories of my modern church was the rather ominous looking king of kings on the cross, carved over the front door. Staring blankly ahead with arms outstretched, he didn’t seem to be suffering as much as sending a mute warning to those passing through below. Of what I wasn’t sure at first, until about the age of seven, until I noticed his garments bore an eerie resemblance to those worn by Zira in Planet of the Apes. It was useless pointing this out to adults, as I already knew from movies they never listened to what kids said until it was too late. Instead, I tended to use the side doors whenever possible, to avoid his stare, and fervently hoped that others in the congregation were also asking God to protect us from any upcoming simian apocalypse while mouthing our rosaries. He hasn’t changed much in the intervening decades, but luckily the Planet of the Apes franchises have, eliminating any ape/human sartorial similarities. He’s back to only being Jesus (which is not a bad thing).